Dalat is a hilly romantic city with a cool 'western' climate. The French named the city Dalat from the latin 'Dat Aliis Laetitiam Aliis Temperiem' ("Giving Pleasure to Some, Freshness to Others", and it is commonly known as 'the City of Eternal Spring', which has made it a popular destinations for holiday makers who want to beat the heat, and for Vietnamese couples, for whom it is known as the city of love. 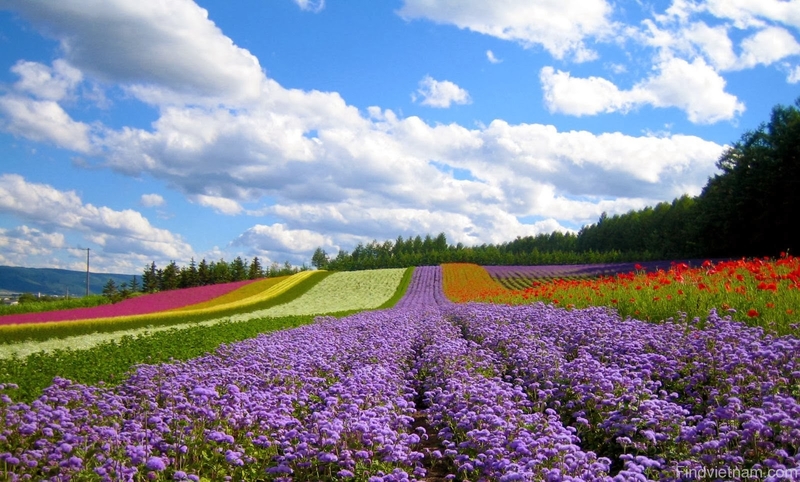 The average temperature is is 17°C, and does not exceed 25°C in the hottest season. In the early mornings, the city arises to mystic fog over the lake. Its temperate climate is ideal for agriculture, and in recent years the number of farms and plantations around the city have grown rapidly. It provides most of flowers and vegetables for the massive markets across the south of Vietnam. 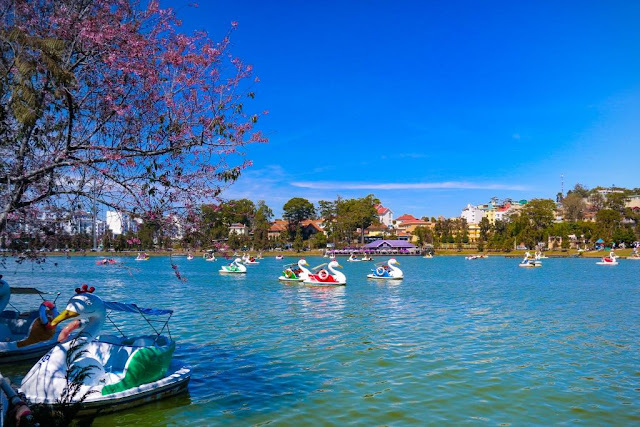 Dalat is also very well-known for its variety of flowers and orchids as well as expansive pine forests, which may remind travellers of home more than the tropics in the valleys below. Dalat is another one of those Vietnamese towns that began as a French resort area. Whatever else might be said about the French, they certainly had good taste in choosing sites for resorts, and Dalat is living proof of that. Designed to be almost a Swiss alpine village, the French urban planner Ernest Hebrard designed the highland town with broad boulevards, elegant villas, a golf course, open green spaces, schools, and modest homes. Luckily for Dalat's modern visitors, the city was virtually untouched during the American Vietnam War, however its popularity amongst amorous Vietnamese couples has lead to a fair amount of kitsch 'attractions' and this combined with the booming agricultural industry means the town is now much busier than the tranquil hill station of the past, with more and more concrete buildings, karaoke rooms and 'mini hotels' springing up across town. 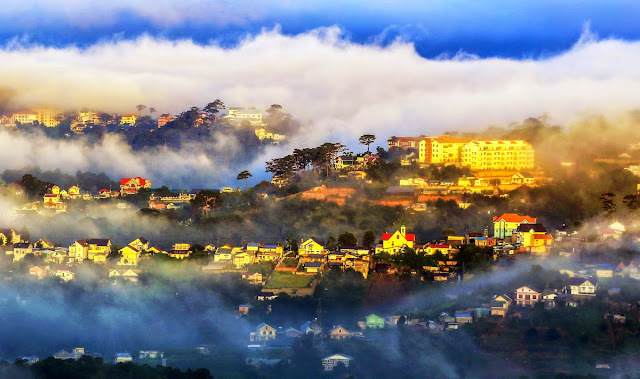 These days to enjoy the best of Dalat it is best to use the town as a base to explore the hills and nature surrounding it than to expect too much from the town itself. The first thing the visitor to Dalat will probably notice is the architecture. 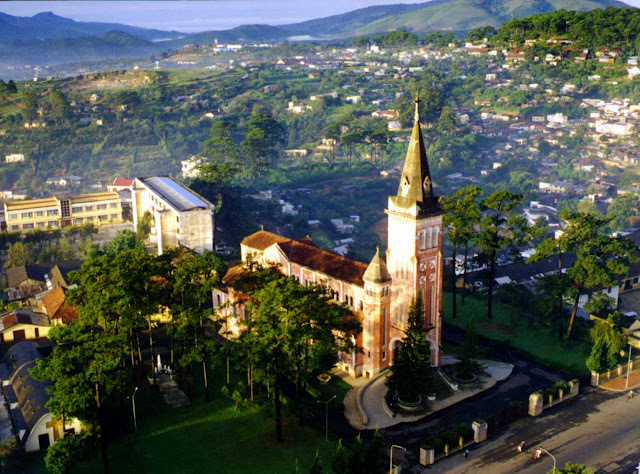 Since the city was built up primarily by the French and the Catholic Church, Dalat is an interesting blend of French colonial architecture, paired with lovely Jesuit structures and Vietnamese pagodas. One site almost all Dalat's guidebooks will lead you to is the Hang Nga guesthouse, known more commonly simply as 'Crazy House'. Built by Hang Nga, Ph.D. graduate of Moscow State University's architecture program, Crazy House is a honeycomb of strange rooms and hallways that also serves as a local hotel. Instead of straight lines and corners, Crazy House is all curves, as if its concrete had melted, dripped, and then hardened into its unusual shape. Another building worth touring in Dalat is Binh III. Emperor Bao Dai built three different villas for himself in Dalat, and although all of them have been restored and made public, it's Binh III that's the most impressive. To stay in Vietnam like true royalty, however, book your room at the Sofitel Dalat Palace, a luxury hotel that's been lovingly restored and sits atop a golf course. With a lobby fit for a monarch's ballroom, artwork adorning its restaurants and suites, together with the modern comforts of satellite television and mini-bars, there's nowhere else in Dalat that offers such plush luxury. Even if you can't afford to stay in the Sofitel Dalat Palace, at least have a cocktail and dinner there in one of the three bars and two restaurants. After dinner, dance downstairs at PK's Disco. Xuan Huong Lake is a popular destination with honeymooners; you can stroll around its outer banks, or hire a paddle boat and go out for a spin. However, be warned that the lake was recently drained, and won't be filled back up until January or February 2011. Xuan Huong Lake isn't the only lake in and around Dalat, though. Just 5 km north of the city centre is the Valley of Love, where a lake was added in 1972 to make its picturesque, peaceful beauty even more attractive. On the other side of town lies the Truc Lam Pagoda, the second biggest Zen Buddhist centre in Vietnam, surrounded by Tuyen Lam lake and pine forests. Just 20 minutes from Dalat lies the Lang Bain mountain; at a height of 2169m above sea level it isthe highest mountain in the Southern Vietnam. It is a popular spot to climb and enjoy stunning vistas of the surrounding areas and it is also possible to camp. For those who don't feel quite so energetic it is also possible to catch a ride to the summit. It is quite easy to get to Dalat as there are daily direct flights from both Saigon and Hanoi. The flight from Saigon takes just 35 minutes while buses run every two hours and take 6-8 hours from Ho Chi Minh City. The best time to visit is November to May, as there is less rain and a pleasant temperature - but be prepared for it to get chilly in the winter months. It is a great place to rent a motorbike of your own to explore the hills, or you could take on one of the 'Easy Riders' who have earnt a great reputation as excellent guides to explore the area and Vietnam as a whole.